Two months ago, I had just sold several items around my apartment to make more room in my office, resulting in $200 in my PayPal account. And on an impulse, I used all my funds on a game that has been towards the top of wanted list for a long time– Snow Brothers (often called Snow Bros). As an NES collector, I’m not always particularly excited to play some of finds. Snow Bros is definitely a game I’m stoked to play. Developed by Toaplan, Snow Bros was released as an arcade game in 1990, before being ported to the NES the next year. The gameplay of Snow Bros. is similar to Bubble Bobble and supports up to two players, with each player taking the part of one of two snowmen Nick and Tom. Each player can throw snow at the enemies. The player must throw snow at each enemy until it is completely covered, when it turns into a snowball. An enemy partially covered in snow cannot move until it shakes it off. Once an enemy has been turned into a snowball, the player can roll it. The snowball will re-bound off walls, until eventually shattering against a wall. Snow Bros should be a solid investment for my collection as well. Capcom games, especially retro Capcom games, often retain their value. Snow Bros is the most expensive Capcom game for the NES, followed by Chip and Dale Rescue Rangers 2. 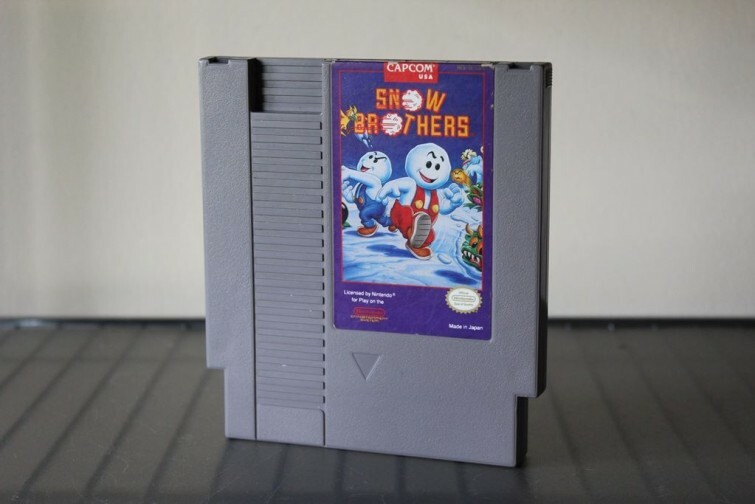 Currently, the lowest priced copy of Snow Bros on eBay is $234. And some of the copies on Amazon have decent prices. The value rose 28 percent since this time last year. If this trend persists, it’ll be worth 258 this time next year. This addition is a big step towards my collecting goals. In NES QUEST pt. 21, I went over my 2015 collecting goals, which involved having 450 NES games in my collection with at least five of them being valued at $100. After my break from collecting for a spell, I’m pretty far behind on this goal. But I’m confident I can catch up a little bit closer to this goal by the end of the year. This purchase brings my collection from 334 to 335 NES games. For the rest of the entries of NES Quest, check them out right here on Retro Chronicle.